5 Point Lutheranism (part 2) | The Old Adam Lives! Points 4 and 5 are discussed here, and then a wrap up. 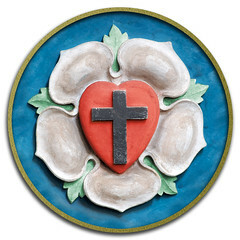 Thanks again, Pastor Mark, and thanks to flickr and TRF-Jen, for the photo of Luther’s Rose. We have 95 points in the theses. In addition we have 40 in the Heidelberg Disputation. That is 145 points and counting matey!!! !